Munchies for that computer junkie! 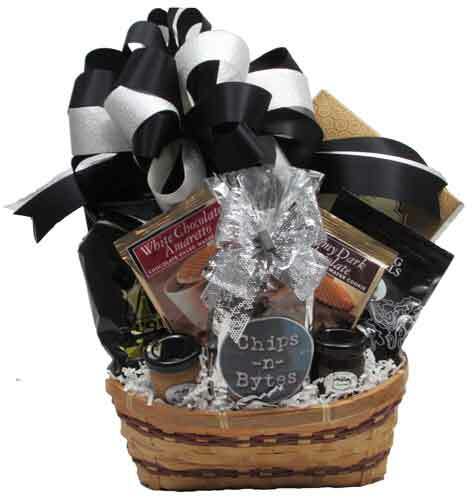 Filled with "Chips N Bytes" Snack Mix (topped with a metallic bow and a computer chip), Ghirardelli Chocolate Squares, Spiced Gum Drops (we can add a themed label for the occasion, like happy birthday, get well, etc. ), Nuts, Amaretto White Chocolate filled Butter Wafer Cookie, Dark Chocolate filled Butter Wafer Cookie, Gourmet Popcorn (Cranberry Walnut Crunch, Pecan Almond Crunch, Dark Chocolate with Sea Salt, or Caramel & Cheddar Jalapeno Crunch), Pretzel Twists (Salted Caramel, Smoky Barbeque, or Cheese Pizza), and a Box of Shortbread Cookies. Wrapped in crisp clear cellophane and topped off with a handmade bow. Includes a handwritten greeting card. Wrapped design for hand delivery approx. 15'h x 12"w x 7"d.
New photo coming soon. Items listed above are in the basket.